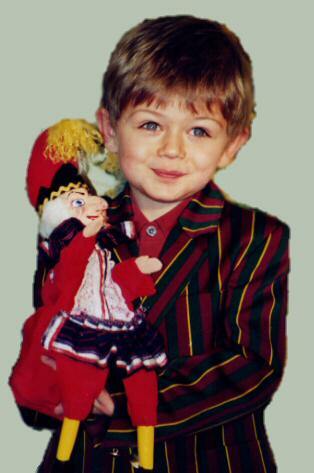 Why do you do "Punch & Judy"? This must be the most common question I am asked. The answer is easy in my case, I was born to it. My father Bryan "Prof. Jingles" Clarke, is one of the most famous Punch performers in the world. He has been performing for 50 odd years and is also one of most prolific makers of Punch & Judy puppets there is. Most Punch performers will have some of his puppets in their collection. It is in the blood. My first show was in September 1976 (when I was 8) on Gorleston Beach, Nr Gt.Yarmouth, where Dad had his first summer season of his professional career. I do not suppose I was much good then, but it certainly made me want to carry on. I waited until I was approx. 15 years old before I decided to do the Punch show proper, so Dad made me practice with Mr. Punch's voice (which is a trade secret of course) until I was good enough to then perfect my show. A Punch performer has to learn "showmanship" as much as anything, so I set off on the long road to learn my trade. This road was never easy and I had some very hard gigs along the way. Now that I am in my early forties and have many thousands of shows under my belt, I perform along side very well known and respected professionals. A couple of years ago I was asked to join "The College of Punch and Judy Professors", so I was overjoyed to be in an association which includes some of the best Punch performers in the UK. I love to perform and most importantly make people laugh. 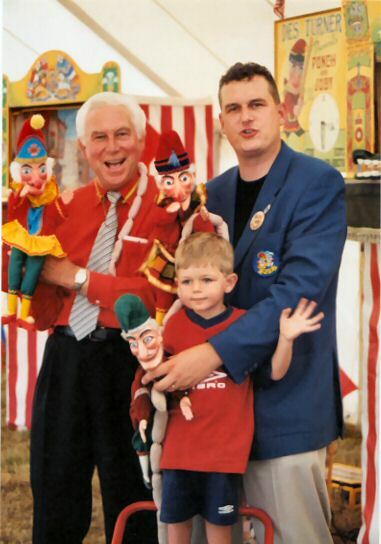 Keeping the Punch and Judy tradition alive is also very important to me and I hope my son Charlie will carry on after me. I always do my best to give the best performance I can, wherever I asked to perform, from shopping centres to festivals abroad, on the TV or Radio, children's parties and festivals with my colleagues of the various associations to which I belong. This life is very short, so I intend to make it as full as possible and keep entertaining people all my life with Mr Punch and the other characters of the show, spreading the word of Punch which is a great British tradition which deserves to be kept alive and relevant in the modern world. I hope one day I can perform my show at your event, so get in touch. (I always have my mobile with me).